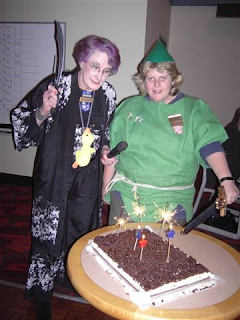 Lake George member and Zone Councillor Fiona Spottiswood, dressed as Peter Pan and Queanbeyan Evening's President Rhonda Winnett dressed as Peking Duck cutting the Birthday cake. Yes, you guessed it, it was a "P" birthday party. Just a tad bit scary if you ask me! 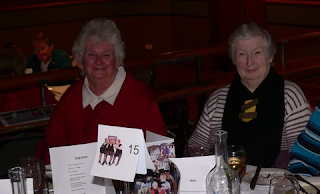 Loyola and Lorraine at the Gala held at the Southern Cross Club. A much more subdued affair! Lydia, Pauline and Anne Maria at the Gala sharing a few laughs. I luurrvvee the cake cutting ceremony with the Peking Duck with the purple rinse ( Ya go gal)and the Green Friend next to her. Awesome Women joining other Awesome Women in celebrations of strenght, caring and great humour..